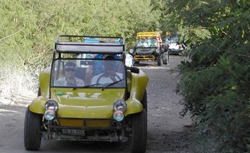 Speed through the rainforest or beaches in an all-terrain dune buggy to get your adrenaline pumping and enjoy scenic views of Costa Maya. We had a wonderful time on this. We had a wonderful time on this. You get really muddy, so be advised! But we loved it and would do it again! Our guides were great! But we got very muddy and the road was extremely rough! Nasty beach and coastline. Got a picture of the real Mexico. Wouldn&apos;t recommend it if you have back problems. Lots of fun. But the dune buggies were run down. great guides...fun vehicles. Didn&apos;t drive on dunes - there weren&apos;t any. Drove on roads up north of the port. Saw some interesting sites of how folks live along that stretch. was a very fun tour, buggies were on their last leg, but was a lot of fun. We got good and muddy and had a blast.. This was so much fun riding the dune buggy through the mud, getting splashed and then relaxing on the beach. The gentlemen that were our guides were FABULOUS.